Iliad Telecom/Free founder Xavier Niel has promised to bring forward the launch of a new multi-play box to help boost the company’s performance in the fixed market. Speaking to analysts after the company posted strong first half results, boosted by ongoing growth in mobile, Niel was reported by Reuters to have said that the quality of the company’s box was a key recruiting tool and that, faced with “aggressive” competition from the likes of Bouygues Telecom, it was necessary to launch an updated device to stay ahead. Niel said that there had come a moment when it was not possible to delay any longer, and that the company would launch a new box to build buzz and boost growth, without giving a precise date. Free’s existing Freebox Révolution set-top and gateway. Free’s major box update was the launch of the Freebox Révolution in 2010. 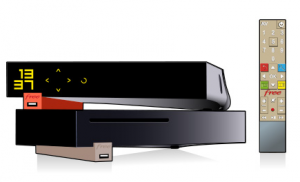 The twin-box device includes a NAs server with a 250GB storage capacity, a Blu-ray player, a gyroscopic remote control, a gamepad and speakers. The group also offers the Freebox Mini 4K, an entry-level box that integrates Android TV and is able to display 4K content. Free’s growth in the fixed-line market has slowed considerably in the face of intense competition and discounted offerings from competitors. The group added 83,000 fixed subscribers in the first half of the year, compared with 200,000 mobile additions in the second quarter alone. The group had 13.14 mobile subscribers as of the end of June, and 6.468 million fixed customers, including 419,000 fibre-to-the-home customers. The company posted revenues of €2.464 billion for the first half, up 7.3%. Fixed revenues amounted to €1.394 billion, up 4.8%. EBITDA was €874.6 million, up 8.2%.